Horner’s syndrome is a neurological condition affecting the eye and facial muscles due to a dysfunction in the sympathetic nervous system. It affects humans as well as dogs, cats, horses and other animal species. The condition is not painful and does not affect an animal’s vision. While some cases of Horner’s syndrome are due to an underlying cause, this is not always the case. Symptoms of Horner’s syndrome include drooping eyelids, sunken eyes, a raised or swollen third eyelid and a constricted -- smaller than usual -- pupil. 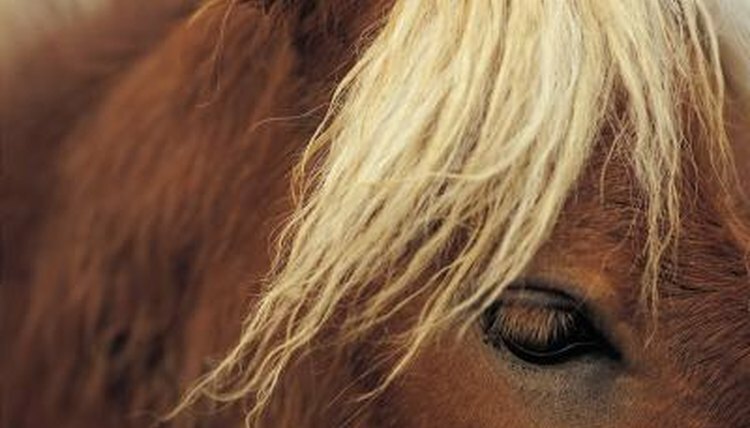 Horses will often have another symptom not seen in other animals. They show signs of noticeable sweating on the side of the infected eye. Often, the cause of Horner’s syndrome is an underlying medical condition or injury. Common medical causes include ear infections, spinal cord tumors, blood clots or eye disease. Injuries, such as bites to the head or neck, automobile trauma and neck injuries due to strong jerks on a collar or leash, can also lead to the syndrome. In some cases, a veterinarian is unable to determine an underlying cause. These cases are known as idiopathic Horner’s syndrome and occur more often with horses and dogs. In dogs, it accounts for as many as 50 percent of cases, especially in golden retrievers and cocker spaniels. On the contrary, this form of Horner’s syndrome is rare in cats. If an animal receives a diagnosis of idiopathic Horner’s syndrome, often no treatment is necessary. Symptoms usually disappear within 16 weeks. If the animal has difficulty blinking, the veterinarian may recommend and prescribe drops. In other cases, treatment focuses on the underlying medical condition. Horner’s syndrome has been associated with hypothyroidism in dogs, so a vet may recommend laboratory testing. The prognosis depends on if there is an underlying medical condition. Idiopathic Horner’s syndrome should resolve itself within a few weeks. In cases of injury or medical condition, prognosis depends on the area infected. If damage is away from the brain and spinal cord, such as in the ears or eye itself, the prognosis is better.